A& S Services' Phil Whiteman aka Phil Graham. Image courtesy ABC News. You’d think that if the joint agency taskforce formed to tackle predatory pre-insolvency and illegal phoenix activity had visited your firm’s premises, the principals of said firm might reassess the way they do business. What, they might ask each other, is it that’s attracted the attention of the authorities? What can we do about it? Decrees might issue forth. Employees ordered to cease all activities. A full and independent review of operations might be implemented. 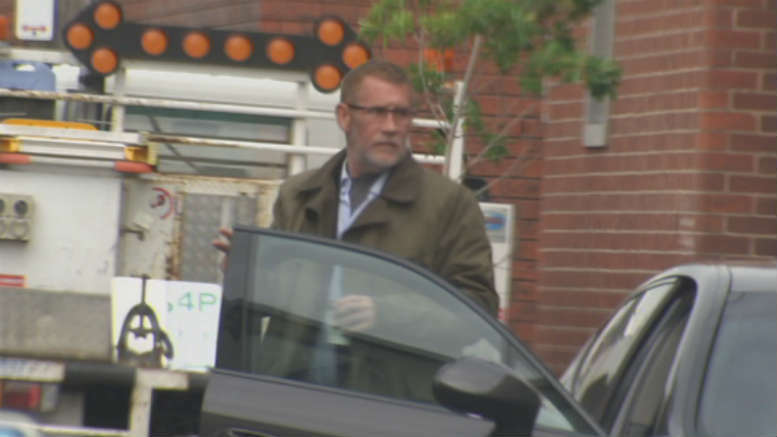 As SiN reported last month in ATO Raid Unearths Banned Liquidator, Melbourne firm A&S Services Australia Pty Ltd was the subject of just such a raid by just such a joint agency taskforce on August 11. It was one of 13 businesses and private residences raided in Victoria and Queensland. On Monday the ABC published a report containing allegations that A&S Services Australia had helped companies likely to be insolvent avoid $20 million in income tax liabilities. The ABC named Philip Whiteman as the prime mover of A&S Services Australia. Whiteman is also known as Philip Graham (pictured above). You’d think it would’ve come as a shock. Dozens of operatives from the pride of the enforcement fleet descending on A&S Services Australia’s premises at Level 1, 2 Adelaide Street Cremorne in Victoria where an estimated 70 staff engaged in activities that had moved tax agents and registered liquidators to the point of complaining to the authorities. But it hasn’t deterred at least one individual from carrying on in a similar vein from the same location, albeit under a different business name. 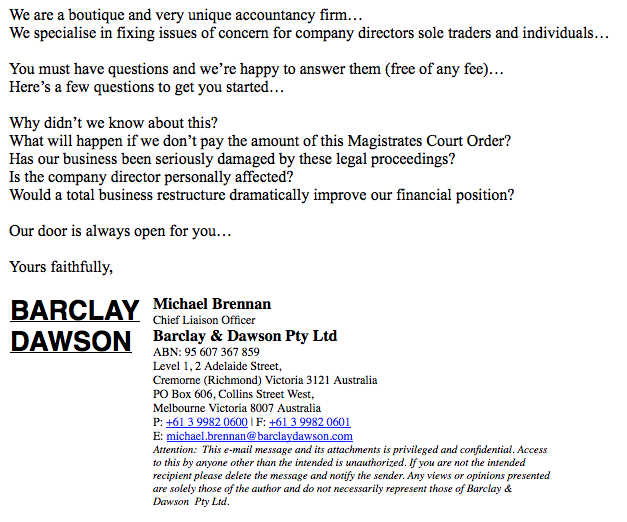 Yesterday afternoon SiN put a call through to Michael Brennan, ‘chief liaison officer’ at Barclay & Dawson Pty Ltd. Although Barclay & Dawson also lists its address as L1, 2 Adelaide Street in the Melbourne suburb of Cremorne, Brennan said Barclay & Dawson “has nothing to do with A&S Services”. He then went on to explain how four or even five businesses – including an olive oil business and a cafe – “operated from the same complex”. So SiN asked Brennan if that meant that A&S Services Australia was happy to share the premises with a competitor, given an email obtained by SiN shows that as recently as October 14, Barclay & Dawson was contacting businesses and individuals that were subject to adverse judgments in the Magistrates Court of Victoria offering answers to the kind of questions unsuccessful defendants invariably ask, including “Would a total business restructure dramatically improve our financial position?” Despite the reasonableness of SiN’s question, Brennan disconnected without answering. A portion of the email can be read below. Excerpt from the email sent to a distressed business by pre-insolvency advisors Barclay & Dawson. 3 Comments on "ATO raid fails to deter pre-insolvency offers"
Sounds like they may have taken some pre-insolvency advice and are busy moving everything over to a new company! A hoot and a great read. The words “Phoenix activity” to come to mind! It is of course interesting that this may be in respect of the pre-insolvency advisers not people that they are consulting.